The solar system probably formed in a way that follows the basic ideas of the so-called nebular hypothesis, which was advanced in the eighteenth century by Pierre-Simon de Laplace (1749–1827) and which has been significantly updated since that time. 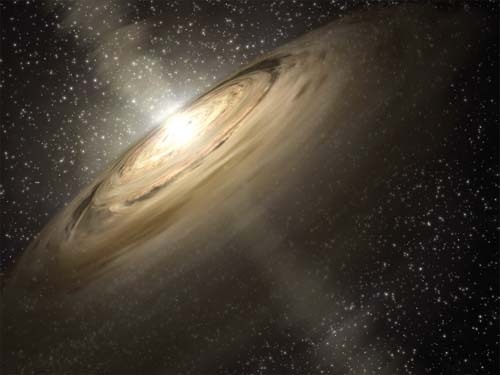 About 4.6 billion years ago, the Sun formed from a large cloud of gas and dust that collapsed upon itself because of gravitational instability. When the Sun was born, not all of the nebula of gas and dust that had been gravitationally gathered was incorporated into the Sun itself. Some of it settled into a disk of orbiting material. As this material orbited in a protoplanetary disk, numerous collisions between the tiny grains led to some of the grains sticking together, making larger bodies. After millions of years, the largest bodies—planetesimals—had sufficient mass (and hence gravity) to start attracting other objects in the disk to them. Growing larger and larger, these planetesimals became protoplanets; the largest protoplanets grew larger still, until at last the planets were formed. Although the solar wind has removed much of the remaining, unprocessed gas and dust, numerous smaller objects (and some of the gas and dust too) still remain today, providing the rich variety of objects and phenomena in a solar system more than 4.5 billion years later.